Tamiya presents the British Challenger 2 MBT to the Military Miniature Series, further adding to the 1/35 scale MM Iraq series of models. Great to build and compare with previously released British MBT including the Centurion (89555), Chieftain (35068) and Challenger 1 (35154) or other vehicles active in Iraq such as the U.S. M1A2 Abrams (35269). 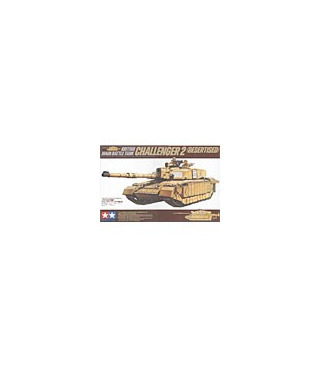 Compared to the Challenger 1 MBT that saw service during the Gulf War, the Challenger 2 features improved second generation Chobham armor capable of withstanding armor piercing and shape charge rounds. The fire control system was updated with the latest digital technology, including a panoramic Commander's sight with built-in laser rangefinder and a thermal gunner's sight. The 120mm L30 rifled main gun provides improved muzzle velocity and accuracy, and enables the Challenger 2 to discharge armor piercing, HESH, smoke and depleted uranium rounds. Special modifications to tanks deployed to Iraq included reactive armor added to the front, composite armor on the sides, a special cover to reduce exhaust heat, canvas skirts to reduce dust ingestion, Commander's Independent Thermal Viewer (CITV) and Combat Identification Panels (CIP). * Accurate replication of Challenger 2 tank including new turret and 120mm 55 caliber smoothbore main gun. * Moveable parts include main gun and CITV. * Features new accurately replicated tracks and wheels. * CITV and gunner's sight lens cover can be assembled opened or closed. * Transparent parts used to replicate gun sight lens, headlights, tail lights and rotating light. * Commander and loader half-body figures and 3 sets of markings included with kit. * Accessories to accurately replicate Iraq version including canvas skirts and CIP included.